Plainspoken Coffee. A Coffee Review for Ordinary People by Ordinary People, #15. A review in our conservation organization coffee series. The National Wildlife Federation, founded in 1938, is a very well-known conservation organization whose mission focuses on protecting wildlife. In addition to lobbying and activism, NWF promotes Backyard Wildlife Habitat for homeowners and schoolyards, and publishes the popular magazines Ranger Rick and National Wildlife. NWF coffee is available through Green Mountain Coffee Roasters, the Vermont company that donates 5% of pre-tax earning to environmental and social causes that has a firm commitment to sustainability (you can read their latest corporate responsibility report here). Happily enough, they are equally committed to good coffee. 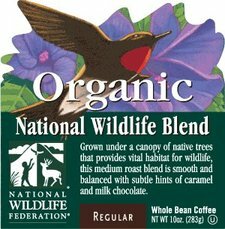 The NWF blend is certified Fair Trade, certified organic, and shade grown. According to the web site, it is a blend of Central and South American coffees. It specifies one source, the La Trinidad Cooperative in Oaxaca, Mexico. This is in the Pluma Hidalgo region, where coffee is traditionally grown under dense shade. Although it is not noted at the Green Mountain site, this cooperative of 230 small holders is or was certified by Rainforest Alliance. So far, so good! Browsing around the other organic offerings at Green Mountain provides clues to other components of the blend. The South American portion must come from the La Florida cooperative in the Chanchamayo region of Peru. This is a large cooperative (1000 farmers) and the last data I looked at showed 167 of them were certified shade grown by Smithsonian. Central American Fair Trade/Organic coffees include one sourced from the Segovia region of northern Nicaragua from the PRODECOOP coop — grown under heavy shade. Their Guatemalan comes from the La Voz Que Clama en el Desierto coop near Lake Atitlan, an area known for growing coffee in the traditional manner. This is coffee you can feel good about drinking. And you will not suffer for it. This was far and away the best “conservation coffee” we tasted, and the best blend we have tried, equaling many of the single origins we have reviewed here. The large beans were roasted to full city, medium brown with a sheen but no droplets of oil. The beans had an interesting whiff of tobacco, as well as a fresh grassy smell. Bright and lively, it had a nice acidic zip and zing when hot (“It’s moving around my mouth,” noted CoalTit). It got smoother and mellower as it cooled, and maintained faint hints of chocolate. We enjoyed much more than we expected, after the other coffees, and thought this would really impress grocery store coffee drinkers and gain converts to sustainable coffee; a couple of us thought we might like it for our everyday coffee ourselves. 3.5 motmots.